There was a bridge, near our place, that was destroyed in a recent flood. No, it wasn't the flood that complicated our lives back in 2011 during Hurricane Irene, but rather a different, earlier flood. Ever since we moved in people have been unable to find our place with a GPS because, for some reason, it tells people to go over this bridge that hasn't existed even though that would actually make you drive past our place and have to circle back. Now, for the last two weeks we live in our current place, the bridge is back! That means if you're trying to find us by GPS in our last weeks here you are in luck! I had Thursday off of work which means I took the guys around town on many walks. 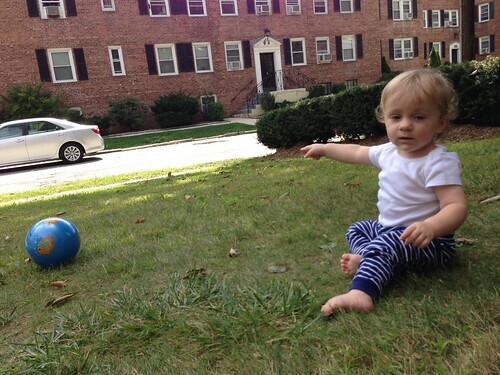 Martin and I played for a while in the grass where he took a particular interest in the car of the guy across the street. The only man more interested in that car is its owner, a man who spends 50% of every snow storm out there brushing his car off as the snow falls. Today he caught me outside and told me that he was impressed with Jen's demeanor and that she is always so pleasant as she leaves for work in the morning. He also warned me of the rot on the tree in our front yard, all while bearing a striking resemblance to Jen's grandfather. He is one of the nicest men I've ever had the pleasure of talking to but probably still only about 40% as nice as Jen's grandfather who may be the nicest man alive today. Before Jen got home from dinner we enjoyed one of our last swings at the park before our move. I spent most of the week recovering from a respiratory infection and, after seeing the most comical New York doctor you can imagine, I was recovering and on antibiotics. The doctor was very impressed with my "nice, chesty cough" and informed me that I should take the antibiotics in the morning with a coffee and a buttered roll. 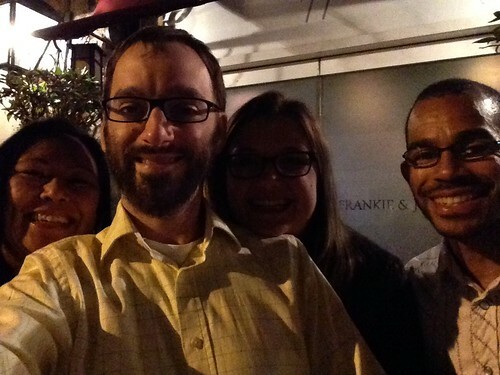 On Saturday we hired a babysitter and went out to dinner with our good friends, Mel and Jule. We'd been discussing going to Frankie & Johnnie's steak house for about five years and our departure from the Empire State was the final shove we all needed to finally get it done. The last time Jen and I went to a steak house together I think it was 2004 or 2005 so it was nice to notch off another decade with a steakhouse visit. It was delicious but not half as delicious as the company of some dear friends who will be greatly missed. Like with everyone we have extended the offer to them to come and stay with us in Chicago in the posh guest room of the house we have yet to purchase. After returning home the guys slept for a tiny bit but woke up around midnight and would not sleep for the rest of the night. They were both quite irritable and had fevers. This proceeded for two nights and left Jen and I in a zombie-like state. It also meant that we fell asleep in weird spots of the apartment and that Martin and Elliott sometimes fell asleep lying on the floor or whatever else it took to finally get them to shut their eyes. Martin has been making a new face, a face that I didn't quite capture in this photo. He makes a face that seems to be a mixture of horror and annoyance. The best part is that he doesn't really make it at appropriate times. Sometimes he makes the face because you have told him not to do something. Other times he makes it simply when you say his name. The ladies at daycare were the first to really identify this face and I'm afraid he will move past this phase before we get a really good picture. Until then enjoy this partial photo of him looking disgusted, possibly because I told him I was going to get him his sippy cup. On Sunday we started off the day with a nice breakfast before heading out to the farmer's market. Martin took a particular interest in the samples of waffles being offered by Pika's Farm Table so I purchased a waffle for him. 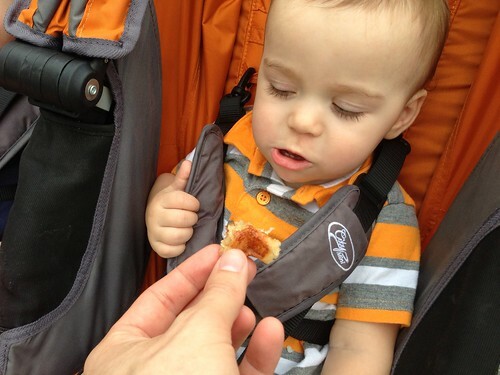 Then I discovered that what Martin had discovered was the world's most delicious waffle. This is good because we've gotten to eat them two weeks in a row. It is bad because we know that we only have two weeks left in the near future with access to these tasty waffles. I actually thought about sneaking behind their booth and trying to see if I could find the recipe so I could steal it. I didn't think about this like some sort of fantasy, I actually, truly thought about doing it. It is convenient, with all these sugary waffles, that I have successfully tricked Martin into brushing his teeth nightly by purchasing these new toothbrushes. The old ones would just make him squirm and fuss. 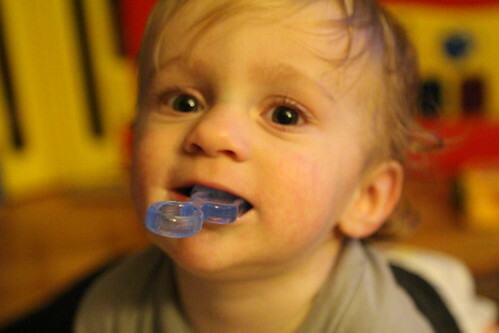 He loves the new brushes so much that he will actually brush his own teeth at night. Elliott, unfortunately, has not been fooled by my tricks. 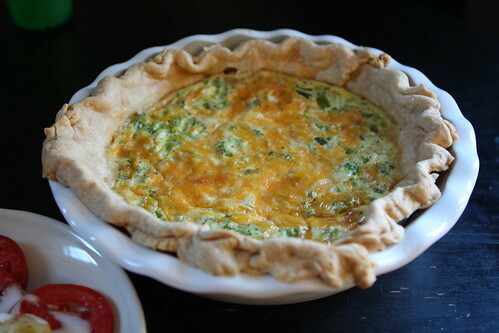 On Sunday Jen made a quiche out of the broccoli and other assorted items from the farm share. She and the Wombats enjoyed it for dinner and I got to have some leftovers the following day. 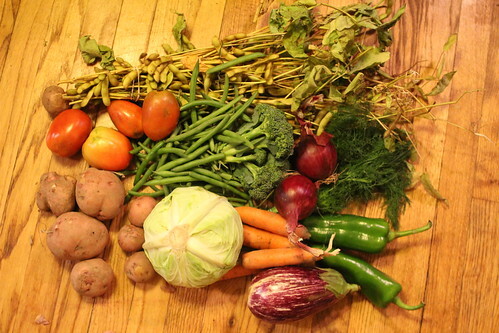 Jen, unfortunately, has had the unenviable task of picking up the babies from day care and picking up the farm share for the past two weeks due to my work and travel schedule. 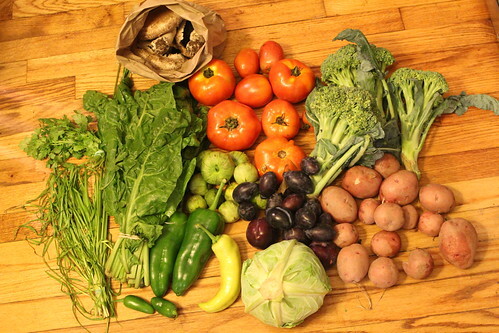 She has done an admirable job and has even made the time to take pictures of the recent hauls. 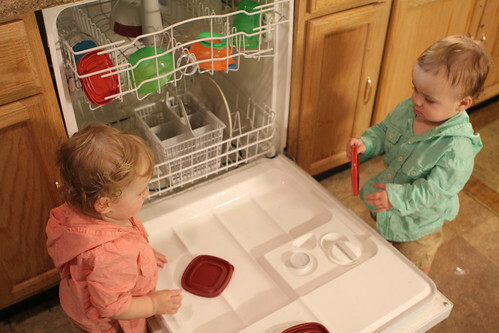 The latest game to keep the babies occupied has been to just set them loose on the dishwasher. They love it. While they are very good in emptying the dishwasher they are not necessarily as good at putting the items where they belong. I'm thinking of just keeping all our clean plates and utensils on the floor moving forward as that would save us a tremendous amount of time and these guys would do a great job of taking care of this chore for the future. Quick note: I recommend taking all the knives and forks out of the dishwasher before allowing babies to play in it. I'm not going to tell you how I learned this safety tip, I'm just going to tell you that you should consider it if you have babies you'd like to have play in your dishwasher. 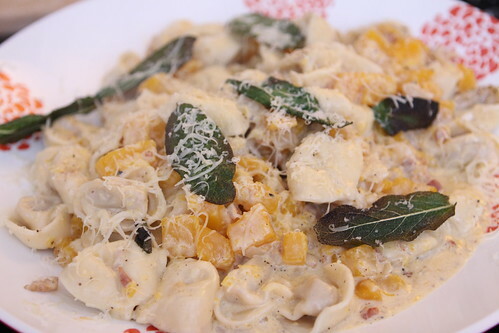 Last night I made this pumpkin tortelloni with rendered bacon, onion, butternut squash, cream, salt, pepper, and grated Parrano cheese, and fried sage leaves. It worked out well but it also just happened to be what I had lying around in the fridge and freezer. The Wombats even had some though they only had a few saving room for their favorite food of all time: peaches! I'm saying goodbye to New York in many ways. One way is in trying to tick off as many beers and breweries off my list as I can that are not available in the Chicagoland area. 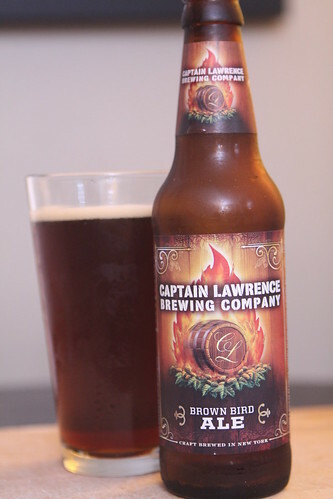 Last night was Captain Lawrence's Brown Bird Ale, a beer brewed not even twenty minutes from our house that we have shamefully still not been to visit. 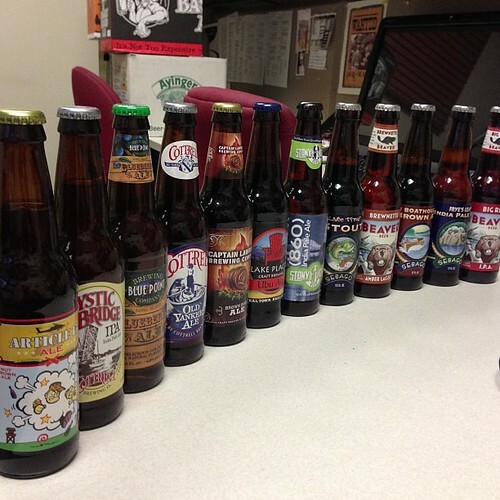 I picked up several different local beers that I won't be seeing in the midwest and will be making my way through them over the coming weeks. While it's nowhere near as sad as not being able to see our good friends and family as much, it's a way of saying goodbye and opening myself up to a great number of beers in Chicago that we don't get out here. I hope our friends and family come and visit often. Our room rates are quite competitive and I'll offer one extra night for anyone who brings me beer I can't get in Illinois. 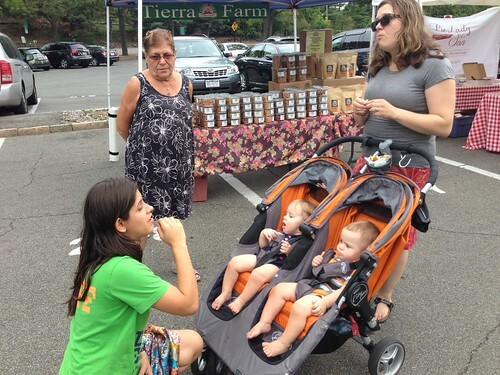 Labels: babies, beer, Cleaning out the freezer, Cleaning out the fridge, Eating Out, How'd we use it?, Seasonal, What'd we get?